What a wonderful visit to Brussels! – something to tick off my bucket list. I love a good city break. Each place I visit I like to do some of the usual touristy things, then go hunting for something that’s a little bit off the beaten track that makes the trip my own. 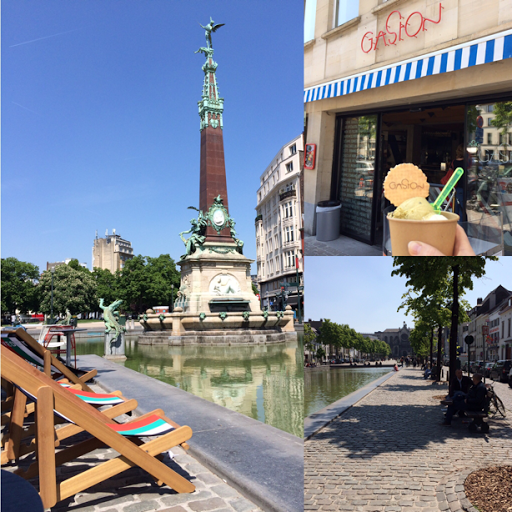 My Brussels’ highlights included chocolate, beer, an Orange Tour and of course some textiles shopping. Here’s a few things I can recommend. Starting with a little bit of shopping. 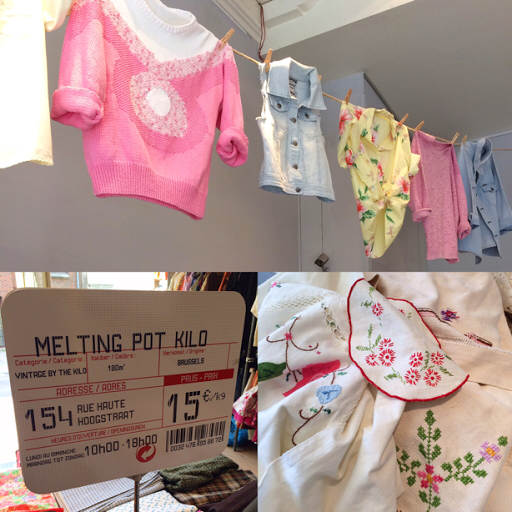 I found some scrummy vintage textiles sold by the kilo at Melting Pot Kilo – including baskets and baskets of vintage embroidered linens. 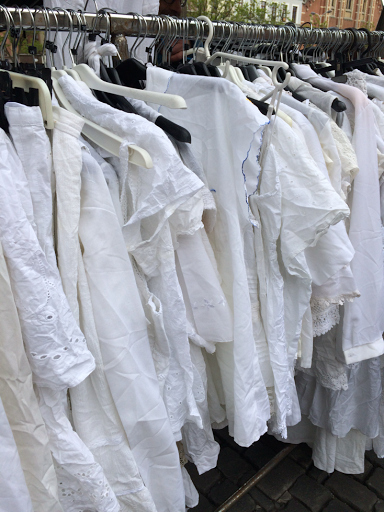 Make your selection from all kinds of vintage goodies – clothes, shoes, handbags, coats, and textiles. It’s an Aladdin’s cave of treasure. 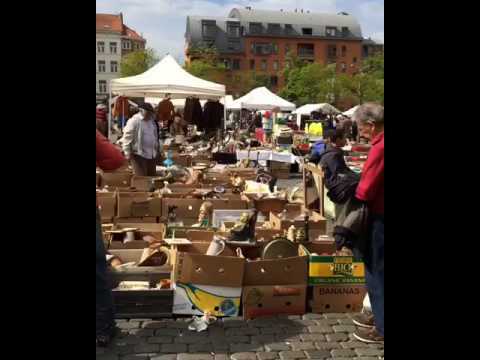 On Rue Blaes – on the way to the famous Marolles flea market – there’s a yummy Mid-Century furniture shop and several eclectic, vintage clothing stores. I loved the curated collections of pieces in these shops – lots of inspiration, nice pieces and nice prices. 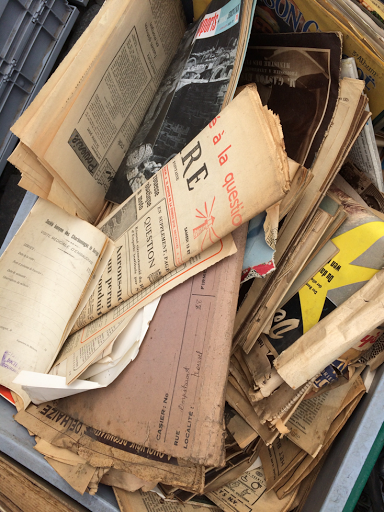 It was such a contrast to the jumbled chaos waiting for me, at the flea market just meters down the road. 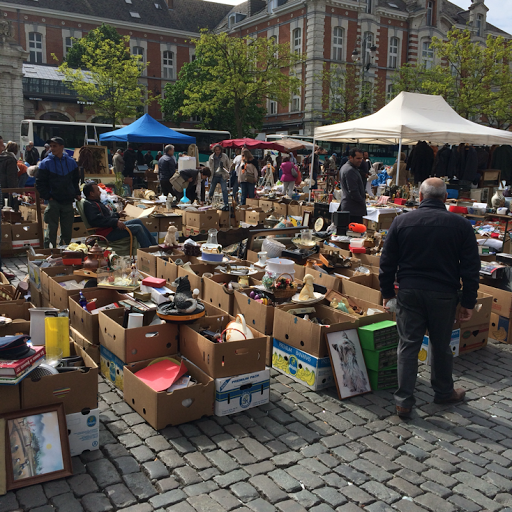 Marolles Flea Market at La Place du Jeu Balle is on everyday 5am-2pm. 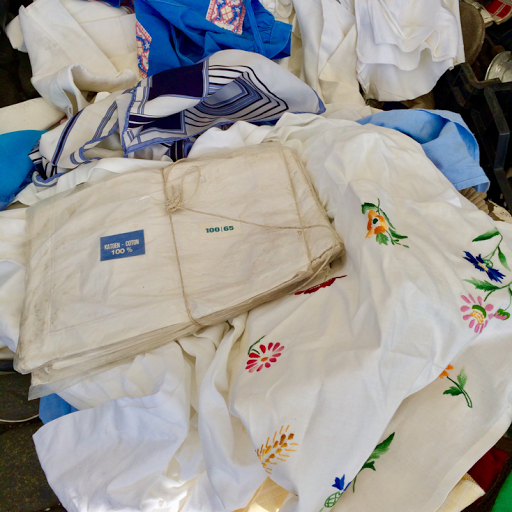 I arrived at 8.30am and spent a good 2-3 hours rummaging – there’s treasure to be found, but it takes time, patience and lots of haggling. There’s plenty of cafes in the square, so you can take a break and rest your legs before returning to the rummaging. Lots more about my visit here on my previous blog post. When I’m not rummaging, I like to look around for inspiration. Around every corner there’s a new surprise. 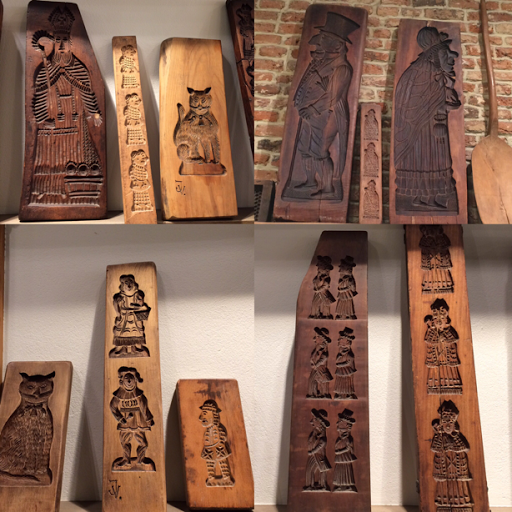 These stunning carved biscuit moulds were on display in the fabulous Maison Dandoy. 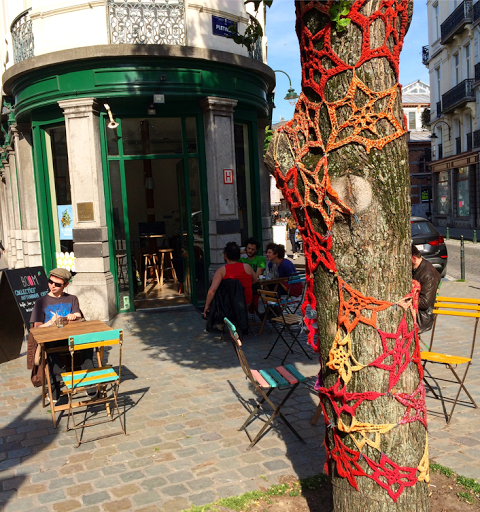 Fabulous, colourful yarn bombing – the crochet was weathered and rather wonderful. Every now and then I find a food place that really stands out. 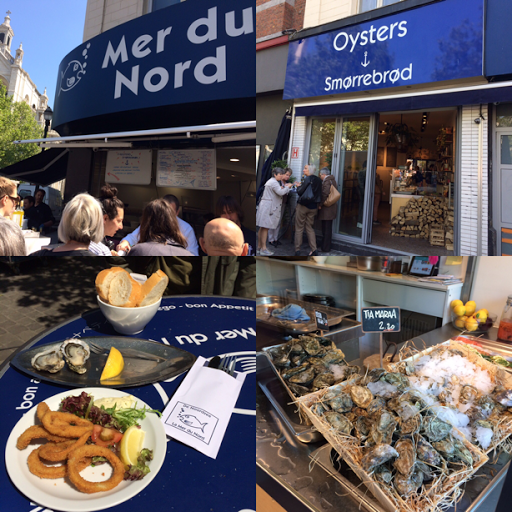 On this visit it was Mer du Nord in Place Saint Catherine with their alfresco tapas style seafood lunch – I had calamari and oysters – all prepared fresh to order. Give them your name & order and find a table – they call out your name when the food’s ready. The place was very busy and had a real buzz. – the deck chair and view were free. There are plenty of galleries in Brussels, but for me the Rene Magritte Museum is a must, especially for all the Surrealists out there. 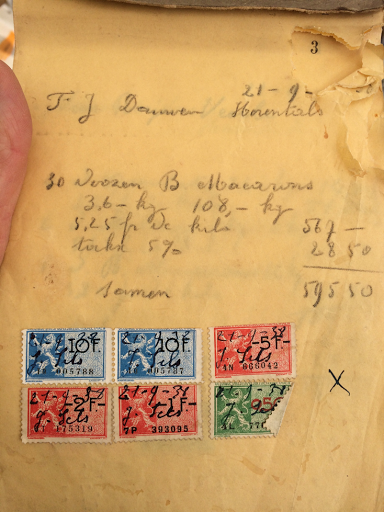 I’d seen postcards of his work before, but to see his life and paintings curated in such a beautiful way was a real treat. Finally beer – it’s everywhere. I can heartily recommend a visit to the Delirium Cafe, (very close to the Jeanneke Pis). With over 3,000 beers in stock you can definitely find a beer to suit your taste buds. 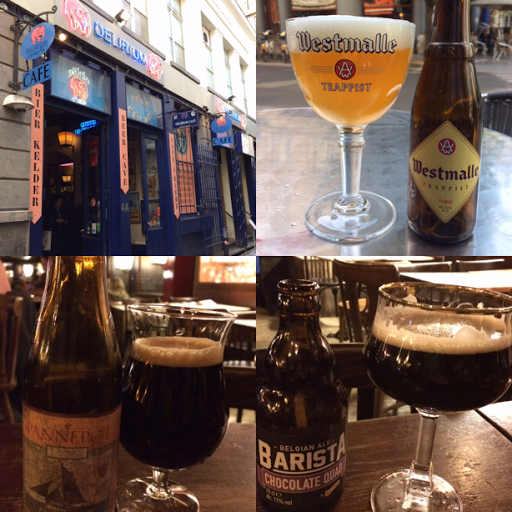 My favourite Trappist beer was the Westmalle Triple. The bartenders here, know everything about everything when it comes to beer. I asked them for two very chocolatey beers – Oh Wow! Barista Chocolate Quad was like very dark chocolate and Pannepot (mine was a 2010 vintage) was like treacle toffee. Delicious and very easy to drink. I hope you’ve enjoyed sharing some of my city highlights. I can heartily recommend Brussels, it’s a very special city and I’m sure I’ll be back again soon. Morelles Market at La Place du Feu de Balle is open everyday 5am-2pm and well worth a visit. 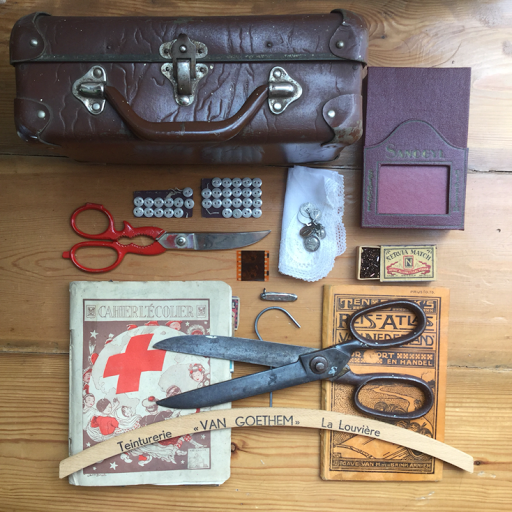 It’s a good old fashioned flea market selling bits and bobs from house clearances. 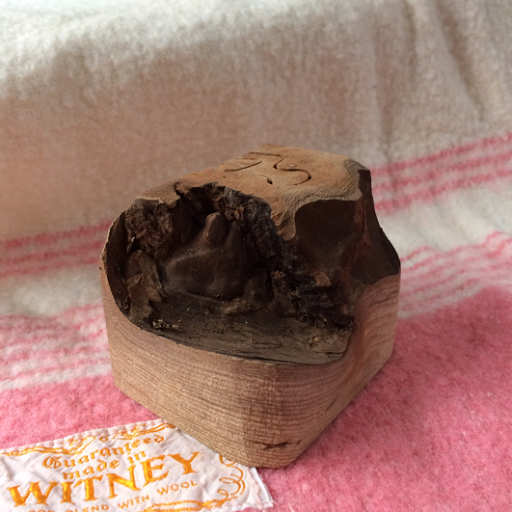 It takes a keen rummager to find the treasure so allow yourself a good few hours to browse. 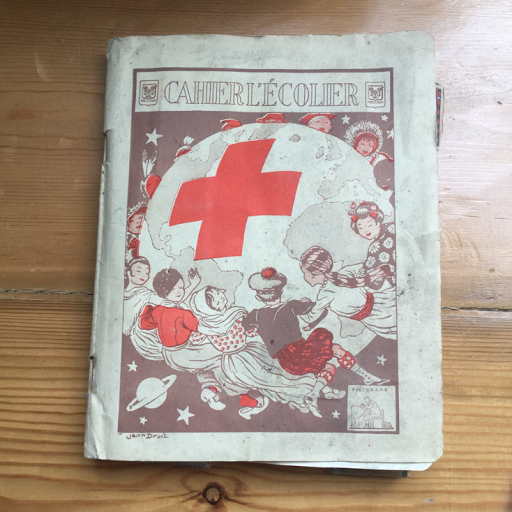 As for prices, I love a good haggle – I managed to haggle down to around half of the original price, only paying what I felt it was worth. 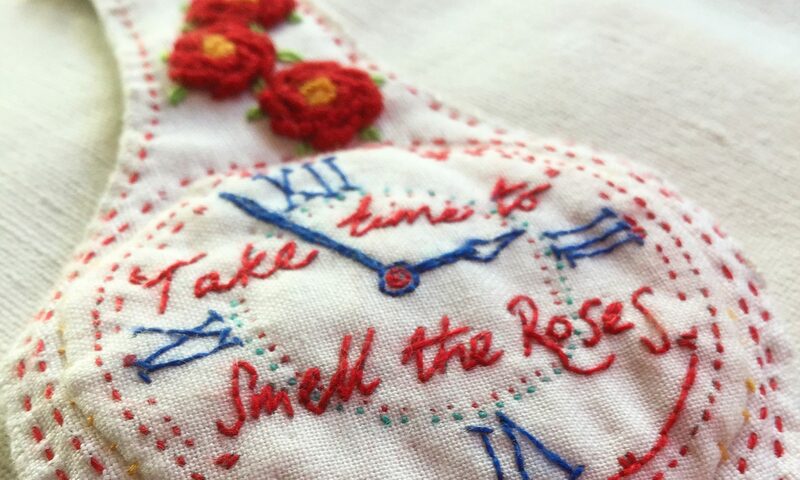 There’s everything from furniture, ceramics, jewellery, paper ephemera and of course textiles. 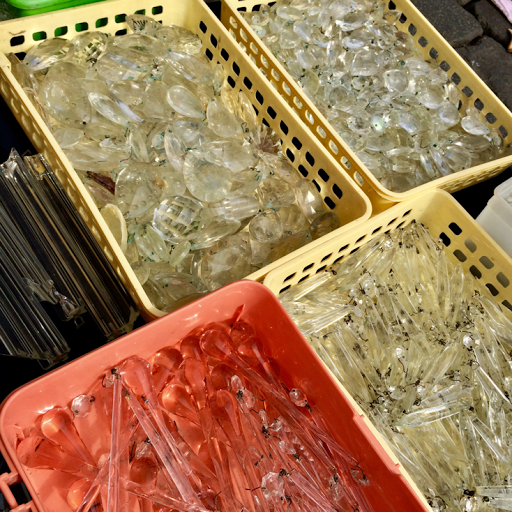 Two stalls had boxes of chandelier crystals. These goodies came home with me. 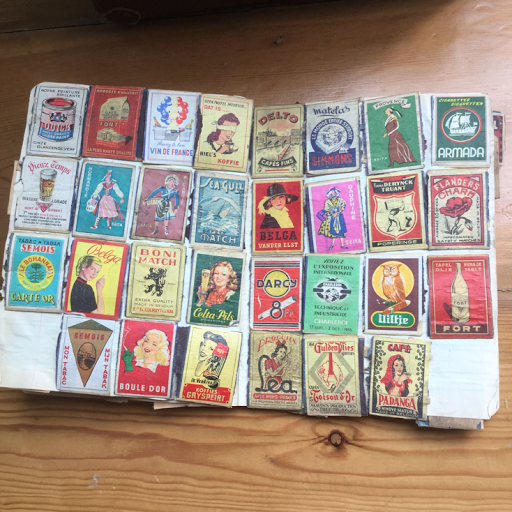 This book is full of vintage wooden matchbox covers. 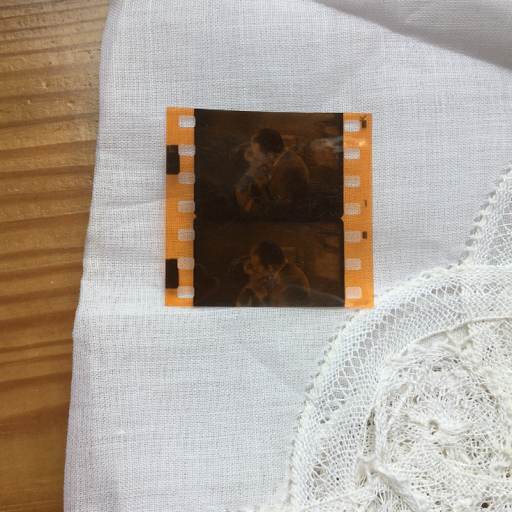 The tiny piece of film – the kiss. I ran out of small bank notes early on and had to buy a coffee at Pin Pon (fabulous bar decor!) to break into another large bank note – note to self: take plenty of change and small notes next time. I arrived at 8.30am and by 11am some of the stall holders were offering ‘anything for a Euro’. It’s a brilliant place with plenty of cafes dotted all around the square. Good food at good prices so you can rest your feet if it all gets too much. 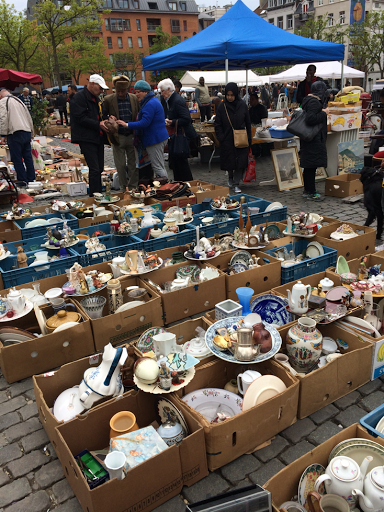 It’s a traditional Belgian Flea Market with an absolutely, fabulous atmosphere. I’ll be returning on my next visit to Brussels with a much larger suitcase. 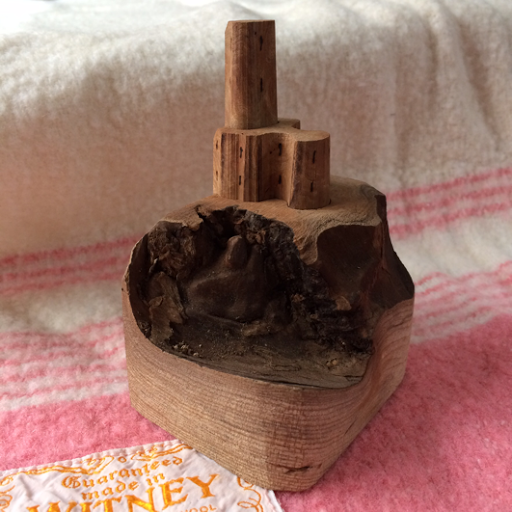 I love my new disappearing Mill on the Hill, my purchase of the day from Living Crafts.